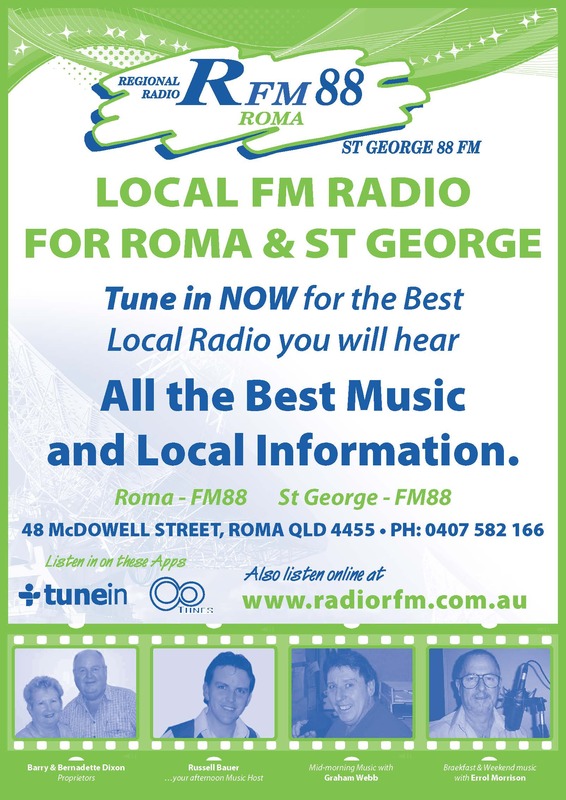 Regional Radio is broadcast on 88FM in Roma and St George. It began as RFM in Roma when businesses wanted a local radio station to reach a local audience. After expnading Maranoa Town & Country Mail to St George and surrounds, proprietors Barry and Bernadette Dixon decieded that it was time to expand the radio station aswell. Tune your radio into 88FM today to listen to the Best Local Radio. REGIONAL RADIO - RADIO R FM 88 is well established in Roma and St George. ­ R FM 88 ­ has now been on air for over five years and is a great alternative local Radio Station according to Station Proprietor and General Manager Barry Dixon. "We continue to get a great response from listeners to our music format," he said, "we are giving St George & Roma a choice in local radio. It's a medium for listeners to call their own. Which they do." Radio R FM 88 is an independent radio medium giving a mature audience in the over 35’s age group an alternative local medium with an popular music format. Barry and his wife Bernadette are proprietors of the family-owned business and also publish the Maranoa Town & Country Mail. They have drawn on their years of experience in the radio & publishing & advertising industry to provide a format suitable for the Roma & St George districts. The station plays "easy listening music, along with hits from the 60’s 70’s & 80’s 24 hours a day". Regular programs include – a Time Zone Top 40 from thr Hits from 40 years ago - Rural News, National News, free Community Announcements and regular programs by professional easy listening announcers. "Our rural background and experience with country people makes it easy for us to relate to the local St George and Roma population. We certainly enjoy operating out business and Radio Station both in Roma and St George." Barry said. Radio R FM broadcasts from a transmitter on McDowall Street, Roma & Victoria Street St George with the production and sales offices in Roma & St George. "Our coverage area is the Roma & St George districts" Barry said. "The people in our coverage area love their music and the mix of music we provide is what the people want from a local Radio Station."